The daily chronicles of motherhood, homemaking, life on the farm and trying to find a little time to knit a few rows, sew a few stitches and maybe get my hands dirty in some clay. I don't have much to show in pictures for the weekend at the house. Because painters are still finishing up and cabinets and floors were late...blah, blah, blah, we're pushing back our move-in date a few weeks. So mid-March is the new goal. This weekend Dan did lots of unglamorous things like installing toe kicks under cabinets, moving around electrical outlets and fussing with toilets and sinks. But, BUT we did get some shelves, people! Dan was disapointed with the cabinets around our refrigerator and didn't like how the fridge stuck out past the side panels. It set the top cabinet back way too deep and made the fridge look like an oversized giant (well, she is pretty giant, I admit.). So he robbed my open shelving, which at the time, I thought was going to make me weep. But I got the "just trust me" answer in reply to my whining. In the end, the man was right. He routered and joined the open shelving to the existing refrigerator cabinet to make a more custom look that fits pretty much perfectly and looks SO much better. 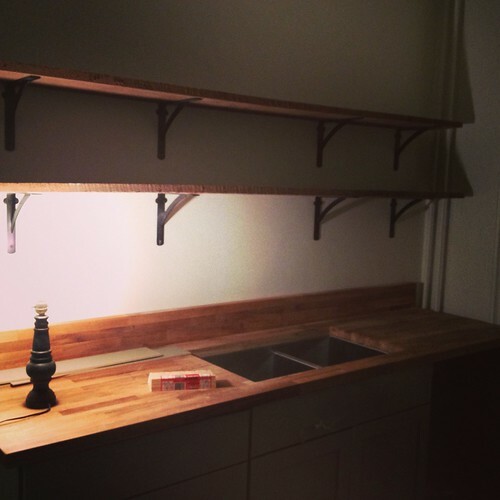 And in return I still got my open shelving above the sink, swiped straight from the barn. And I love it even more. My favorite look in a kitchen is a more pieced together electic look versus an "everything matchy-matchy and just-so". So the shelves couldn't make me any happier. In the meantime, Birdy has become master sawdust vac'er. 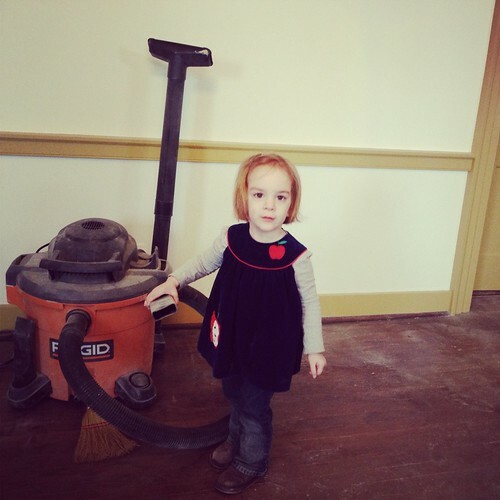 The girl can operate a shop vac like nobody's business. It's a life skill, I tell you. Ok. I'm so happy to see that dress! It's so cute on her! SO great! I'm thrilled for you all and your new, beautiful diggs!!! Congratulations! Hold up- when did Birdy get so big!? My goodness! Those open shelves are lovely.